Stair lifts come in curved and straight varieties. If your home has a straight staircase, the type of stair lift you need is a no-brainer. Some homes, on the other hand, have L-shaped or curved stair cases. 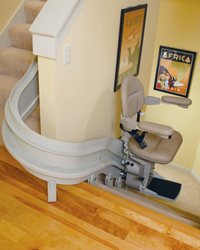 Although two straight stair lifts can make an L-shaped stairway accessible, curved staircases require a custom design. If a curved stair lift is your only option, you may be asking yourself, “What’s the difference between straight and curved models?” Both have similar operating mechanisms, but a curved stair lift requires a custom rail, one angled exactly to the shape of your staircase. Nearly all angles are possible, and a curved stair lift can be designed with a 90- or 180-degree turn to go across a landing. Before a curved stair lift is put together, the staircase in your home or commercial building needs to be surveyed. Indy Stair Lifts measures and photographs the area, and this information is given to our factory. A curved stair lift takes four to eight weeks to be put together, and six to eight hours are needed to install the fixture into your home. Because of the amount of labor and time needed, a custom curved stair lift costs three to four times as much as an ordinary straight model. At the same time, however, the stair lift fits your staircase perfectly and allows you greater mobility inside your home. Indy Curve Stair Lifts can be installed into homes and commercial buildings. Built with a vertical rail, the Indy Curve uses a direct drive motor and operates on battery and direct power. The device supports up to 400 pounds and has a compact design with a folding seat, armrests, and chairs. Aside from these features, the Indy Curve is like any other stair lift, built with a swivel seat and an emergency switch that senses obstructions.